Sometime after midnight in the western part of Kansas I was jostled out of my half conscious state as we pulled into a gas station. In the past 40 hours I had managed barely 6 hours of broken light sleep spread out over two plane rides and the first driving leg out of Denver. 950 miles separated us from a bed in Cincinnati and it was my turn to get behind the wheel. It took 100 miles before the madness peered out from the darkness and started pulling on strings attached to my perception of reality. Hundreds of miles of perfectly straight dark road, the divided lines flashing past, the high beams reveling a static image as we barreled along, it all started playing with my mind. Hours passed and I’d only traveled a handful of miles, followed by 50 miles I have no recollection of. “Get a grip” I’d mutter, and on into the night we raced. Then I saw it. Floating low on the horizon a massive orange slice. My brain searched for explanations. Fast approaching a town it could only be an illuminated gas station roof. Sure, that’s it. I’m back in the 50’s with their swooping styles and glowing dreams of the future. But no, as buildings and light poles shifted slightly this orange slice remained absolute in it’s position. Halfway through the quiet Kansas town it hit me. “That’s the freaking moon!” Ten times larger than I’v ever seen it, sitting low and just above the horizon this was the moon guiding me east. I blinked and it was gone. Another hour missing, lost to the madness that only sleeplessness brings. The moon now sat above the windshield small and brilliant silver, laughing at the reverence I had felt. I pushed back, resolute in my refusal to surrender. And from the darkness I heard laughter and glee that the fight would continue. Gas. I needed to find a gas station, walk around, get a drink. That would save me. That would stave off the demons that were pulling on my eyes, crossing my vision and playing tricks on my mind. It worked, for a while. Until the sea of blinking red lights found me. All my energy in use focusing on the vanishing point of the road ahead of me I barely noticed that the peripherals of my vision were flashing. Dashboard warning lights? Aliens? Law enforcement? Relaxing my death stare on a point I’d never reach I saw them. Hundreds of small red lights stretching out to either side of me. It had me, the madness, ruthless in it’s onslaught. Windmills. I had the answer, but it was long after I needed it. The madness had me. Hours had passed while I searched for a sane explanation, yet the odometer laughed and ticked off a single mile. I knew I had lost. The madness cheered it’s victory by dancing on my eyelids. I pulled over and swapped seats with my groggy passenger. 680 miles to a bed that would ultimately grant 4 hours of sleep. 1430 miles to home. I gave into the madness. Note: This is a highly exaggerated recollection of my stint of an overnight drive from Denver to Cincinnati. At no point was I really in danger of crashing and killing us both. But the truth is boring to read, hyperbole sells stories. 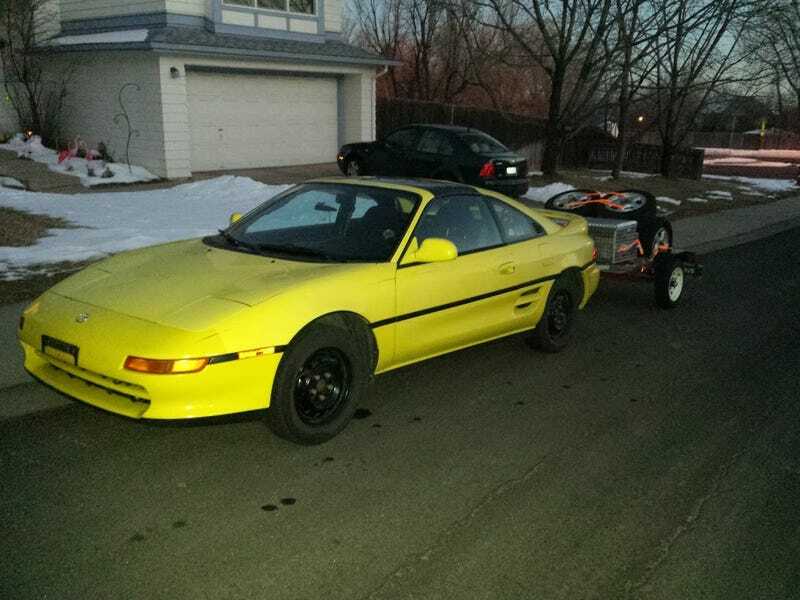 The true details are that I was asked last minute to fly to denver and help drive home to CT a 1991 MR2 that my friend just bought. Of course I said yes. So at 1:45am after a New Years party I jumped in my car, drove to CT, and got on a 6am flight. In 85 hours I slept a total of 13 hours, 9 of which were very broken glorified naps on airplanes or in a passenger seat. It was an amazing way to kick off 2016.